With a compelling current and whipping wind on San Francisco Bay, Italian skipper Max Sirena thought racing twice a day in the America's Cup challenger finals would be "pretty painful" for the new high-performance catamarans. Just finishing one race has proved problematic. Emirates Team New Zealand sailed away with another win because of a mechanical failure to Italy's Luna Rossa, taking a 2-1 lead in the Louis Vuitton Cup finals Monday. Skipper Dean Barker guided his boat underneath at the start and made a slick move inside Luna Rossa on the first turn to go ahead. The Italians still started strong and stayed close until the control arm of their wing broke, forcing another withdrawal in a series beset by big breezes and breakdowns. "I would not be sleeping pretty well if I was the designer of one of these boats," Sirena said. For the third straight day, officials called off the second race due to exceeding wind — and bailed out a broken boat. The next two races are scheduled for Wednesday, when organizers are counting on a coming flood tide to reduce the drag of a strong wind forcing another postponement on a series that already has dragged. All three wins in the finals have come by withdrawals. The winner of the best-of-13 series will face defending champion Oracle Team USA in the 34th America's Cup starting Sept. 7. "It's getting massively frustrating," Luna Rossa grinder Giles Scott said. "At the moment, the racing has been almost governed on who can get around the course as opposed to win the races." This summer has been full of setbacks for the regatta. British sailor Andrew "Bart" Simpson died in the capsize of Swedish Team Artemis Racing's first boat during a training run May 9. Oracle is still fighting off an alleged cheating scandal for illegal modifications to its prototype boats used last year and early this year. And the 72-foot catamarans — so expensive and dangerous that only three challengers entered the competition — are failing more than foiling. "It'd be nice if we can get one race where both boats race all the way till the end," Barker said. Emirates tore the trampoline tarp in the center of its catamaran during a nosedive that sent two men tumbling overboard in the opener. The Kiwis still won because the Italians struggled to fix a broken lifting system around their right daggerboard. Emirates led Luna Rossa by 400 meters late in Sunday's race when the electronics system that controls the hydraulics shut down. Workers had to come aboard to fix the problem, handing Luna Rossa — which had a few cracks in its wing, a problem Sirena said is unrelated to the broken control arm — the tying win. Monday's first race started an hour earlier in hopes both could finish before the typical afternoon breezes whip up. Instead, another uncontested win and postponement followed. The Kiwis made a smooth foiling gybe — when a boat changes direction while sailing downwind and stays on its foils — at more than 30 knots (34.5 mph) to send them through the leeward gate about 21 seconds in front. As both boats turned right toward Alcatraz Island, the Italians pulled up with problems controlling their wing. 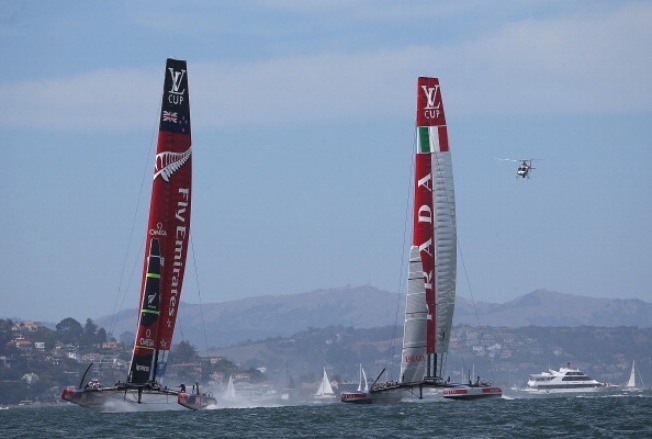 Luna Rossa is still winless against favored Emirates when the Kiwis' catamaran is functional. The Kiwis went 5-0 against the Italians in the round-robins, including the opener that Luna Rossa boycotted because of a rules spat — another embarrassment to the regatta. The Kiwis twice beat the Italians by more than 5 minutes, and the closest margin was 2:19. The current course is five legs, which is three shorter than the one used during the round-robins. Sirena said he "never thought we could be so close in performance" to Emirates now and is hoping to get the chance for a head-to-head race till the finish. He said part of the problem for the breakdowns in the finals is that the "fragile boats" are still so new and being pressed harder than ever before. "When you're sailing alone around the course, even in 20 knots, you'll really be scared because you can put the boat down," Sirena said. "Then when you have another boat next to you, that scare has gone away because you want to beat the other guy and you push way harder than normally." Oracle is working to repair its own damage. The American team, owned by Oracle CEO Larry Ellison, has been branded as cheaters by the two remaining challengers after it was found that two of its three prototype boats used in warm-up regattas last year and early this year were illegally modified. An international jury is investigating and could sanction Oracle with a fine, forfeiture of races in the America's Cup match or disqualification. The jury issued notices Monday morning that it is moving forward with the investigation but said it would not announce the date of the hearing, though Sirena said he heard it would be held next week. America's Cup CEO Stephen Barclay said he expects a decision by the end of the month.